We are dedicated to providing excellent driver education throughout Arizona. 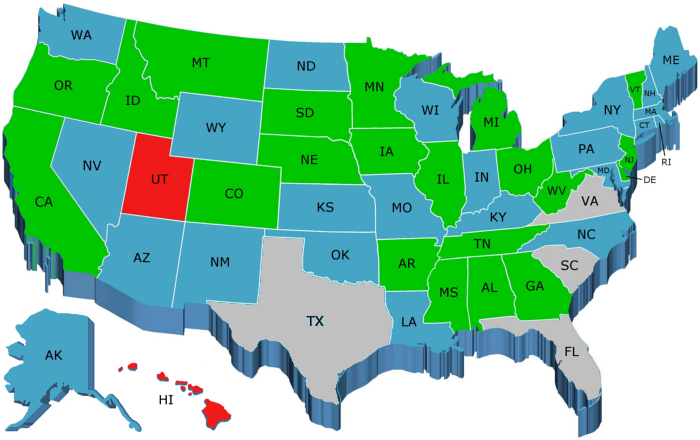 NOTE: GREEN indicates "reciprocity," i.e., the honoring of licenses from all states without additional restrictions. You have a green light to drive through these states. BLUE indicates a minimum age requirement and possibly other restrictions. RED denotes NO acceptance. Gray states add additional restrictions. When talking on the phone with an officer or state agent, ask if you are required to follow the restrictions from his state in addition to your own. Be ready to read him your state's restrictions if asked. The primary restrictions on level 1 (learner's) licenses have to do with age and adult supervision (usually a parent). Restrictions on level 2 (intermediate) licenses have to do with age, nighttime and passengers. The Governors Highway Safety Association puts out a quick reference guide to age, nighttime and passenger restrictions. AAA provides a full listing of GDL restrictions in their Digest of Motor Laws. Will accept any valid level 1 or 2 driver license subject to restrictions mandated by the issuing state. You must be accompanied by a licensed driver at least 21 years old with at least one year of driving experience and they must sit in the front seat whenever you drive. NOTE: If under 16, even if you have an instruction permit from another state, you must have an Alaska instruction permit before driving in Alaska. Will accept an out-of-state driving permit provided the driver is at least 15 year 6 months of age and the front passenger seat is occupied by a licensed driver at least 21 years of age. If you are at least 16 years of age, you may drive here with your out-of-state permit adhering to the same restrictions that have been placed on your permit, and following Connecticut's restrictions for learner's permits. You must be under the instruction of a licensed driver who has held a license for at least four years. Drivers with a learner's license may only drive during daylight hours during the first three months after issuance and until 10 p.m. thereafter, and always with a licensed driver who is at least 21 years old and occupies the front passenger seat. Will NOT accept any out of state driving permits. Permit holders may drive in Indiana providing either they are at least 16 years of age, or 15 if carrying documentation proving they are enrolled in a driver education program. They must also be accompanied in the front passenger seat by a licensed individual 21 years of age or older who is related to the permit holder by blood, marriage or legal status. If the permit holder is 18 years of age or older, they must be accompanied by a licensed driver with valid driving privileges who is at least 25 years of age, or with a spouse provided he/she holds a valid license and is at least 21 years of age. Kansas honors valid out-of-state driving permits as long as the operator is at least 16 years of age. A valid permit holder from another state must be at least 16 years of age to drive in Kentucky, and must be accompanied by a licensed adult at least 21 years of age. Louisiana will honor out-of-state learner permits, provided the driver is at least 15 years old, with a licensed adult 21+ years of age sitting in the front seat next to them. A person with a valid learner's permit issued by his/her home state can legally drive in Maine provided that person is at least 16 years of age and adheres to all restrictions applied to the learner's permit issued by that person's state or province. The permit holder is at least 15 years + 9 months of age. The individual is accompanied by and under the immediate supervision of an individual who is a least 18 years of age and is seated beside the holder of the learner's instructional permit. A person who is sixteen years of age or over and has complied fully with the laws of such state is granted similar privileges of operation in the Commonwealth of Massachusetts. The holder of a Learner's Permit may operate a motor vehicle upon any way when accompanied by an operator duly licensed by his state of residence, who is 21 years of age or over, who has had at least one year of driving experience and who is occupying a seat beside the driver. A Permit holder who is under the age of 18 may not operate a motor vehicle between the hours of 12:00 AM (midnight) and 5:00 AM unless accompanied by his parent or legal guardian, who is a licensed operator with at least one year of driving experience and whose license or right to operate is not revoked or suspended. An out-of-state permit holder may drive in the state of Missouri if they are at least 16 years old and they obey all provisions of their home state's permit. Will accept any valid level 1 or 2 driver license subject to restrictions mandated by the issuing state and the State of Nevada. Drivers under 18 who are licensed to drive without parental supervision may not drive between the hours of 10 p.m. and 5 a.m. unless they are traveling to or from a scheduled event such as school events or work. Law enforcement may ask for satisfactory evidence of the event. Also, these drivers may not transport any passenger under the age of 18, except for immediate family members, for the first six months after the license was issued. A person learning to drive is permitted to drive under certain conditions. The driver must be at least 15½ years old and must carry proof of age in the vehicle. The person learning to drive must be accompanied by a parent, legal guardian, or other responsible licensed adult 25 years of age or older. The vehicle used for practice must be a non-commercial vehicle. The adult accompanying the person who is learning to drive must sit in the front seat of the vehicle and must hold a current, valid driver license. NOTE: The accompanying adult shall be liable for any motor vehicle violation committed by the unlicensed driver. For anyone under 17 years of age, with a permit or license, the vehicle must be registered in the same state that the permit/license is issued from. That person must abide by the rules, regulations and/or restrictions as set forth by the issuing state. For anyone 17 years of age or older, New Jersey does not place any restrictions on that person. However, whether it is a permit or license, as noted above, that person must follow all rules, regulations and/or restrictions as set forth by the issuing state. New Mexico will honor learner permits issued by other jurisdictions, provided that the driver is at least 15 years old, with a licensed adult sitting in the front seat next to them. If you are under age 16, you cannot drive in New York State, even if you hold a permit or license issued by another state. If you are age 16 or older and hold a learner permit, junior learner permit, or junior driver license from outside New York State, you must obey any restrictions imposed by the state that issued your permit or driver license, and the New York State general learner permit restrictions. An out of state learner's permit is NOT valid in New York City. In all areas of the state except New York City and Long Island (Nassau or Suffolk counties), a non-resident licensee under 18 years of age may operate a vehicle from 5 a.m. to 9 p.m. only when accompanied by a licensed driver age 21 or older who has a valid license to operate the vehicle you are driving. Any nonresident driving in North Carolina who is at least 16 years old and is abiding by the restrictions on their learner's permit or license as required by the issuing State is authorized to drive in this State. All out of state driver's that drive through North Dakota must be of the age of 16 or older. They must meet all their permit restrictions and also have a licensed driver with them that is over the age of 18 and has held their driver's license for 3 years minimum. A non-resident who is sixteen 16 years of age or older may operate a motor vehicle in Oklahoma as authorized by the class, restrictions, and endorsements specified on the license. The non-resident must be properly licensed in the home state to operate a motor vehicle and be in immediate possession of a valid driver license issued by the home state. A teen driver 16 or older with a permit from another state may drive in Pennsylvania as long as they are accompanied by a licensed driver 21 or older who sits in the front passenger seat. If you are at least 16 years of age, you may drive here subject to the restrictions of your home state and those of Rhode Island. South Carolina recognizes out-of-state beginners' permits for driving. You may drive if a licensed driver who is at least 21 years old and has at least one year of driving experience accompanies you in the front seat. Will accept any valid learner's permit subject to restrictions mandated by the issuing state, and that the permit holder be accompanied by a licensed driver 21 or older who is seated in the front passenger seat. Will NOT accept any out-of-state driving permits. Will accept any valid level 1 or 2 driver license subject to restrictions mandated by the issuing state.for up to 30 days. In addition to any regulations your state/country places against your learner's permit, Virginia will allow you to operate a motor vehicle while here, as long as you adhere to both your home state's rules and ours. Virginia's regulations allow learner's permit holders to operate a motor vehicle when a licensed driver at least 21 years of age is seated beside them. The driver accompanying the learner's permit holder may be 18 years of age if he or she is the legal guardian, brother, sister, half-brother, half-sister, step-brother or step-sister. Virginia law restricts the ability of drivers under age 18 to use cellular telephones or other wireless telecommunications devices. Drivers under age 18 are not permitted to drive while using any cell phone or other wireless telecommunications device EXCEPT in a driver emergency. Cell phones and wireless telecommunications devices MAY be used when the vehicle is lawfully parked or stopped. When responding to an emergency call as a volunteer firefighter or rescue squad personnel. Non-residents who are at least fifteen 15 years of age may drive in Washington as long as they are in possession of a valid instruction permit issued by their home state. In addition, a licensed parent driver must be seated beside them, or a licensed adult 18+ years of age with no passengers present in the vehicle under age 18. You may drive in Wisconsin if you hold a valid instruction permit from another state and are at least 16 years old. You will be issued an instruction permit that is valid for 12 months from the date of issue and can be renewed. The restrictions of this permit will be listed on the reverse side of the card that is issued. NOTE: Points assessed for traffic violations are doubled for second and subsequent violations when operating with a probationary license, instruction permit, or prior to obtaining the instruction permit. If a person with a learner's permit from another state operates in Wyoming, they are legal so long as they are at least 15 years of age and comply with the restrictions imposed by the issuing state. Online Defensive Driving is for drivers who receive a citation and are eligible to have the citation dismissed if they complete a Defensive Driving class. This class can be attended at location of your convenience, online from a computer. This class is compliant with State of Arizona rules & regulations.